The MoD has released new data on UK drone operations in Iraq and Syria to Drone Wars in response to a Freedom of Information request. Figures for the second quarter of 2015 show a significant rise in the number of Reaper drone flights in Syria since the beginning of the year. In January just over 10% of UK Reaper drone sorties took place in Syrian airspace. In June 2015 this had risen to 40%. This may be attributable to more UK Reapers having apparently been sent to the region. However while the number of monthly UK drone missions in the area has increased slightly (by around 10-15%) the number of drone missions solely within Iraq has dropped between January 2015 to June 2015 by a quarter. This could be just a blip, but it could also give evidence to those who argue that any new UK focus on ISIS in Syria will simply take away from operations within Iraq. *UK have revised the way they calculate strikes to bring in line with US figures (see here). 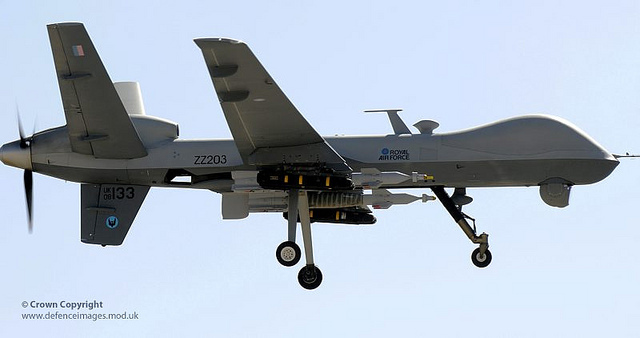 The latest figures also shows that UK Reapers – constantly billed as for ‘intelligence, surveillance and reconnaissance’ – continue to launch strikes in Iraq at virtually the same rate as the UK’s dedicated strike aircraft, the Tornado. Although the UK has changed the way it calculates air strikes, according to MoD figures from 9 November when both Reaper and Tornado aircraft have been carrying out strikes to 30 June 2015, Tornados carried out 140 strikes giving a strike rate of 4.2 per week, while Reapers have carried out 130 strikes giving a strike rate of 3.9 per week. While there have apparently been no direct weapon launches from UK drones within Syria the MoD has refused two separate information requests from us seeking data on the number of strikes facilitated by UK Reaper drones by means of laser designation, surveillance support or tracking of targets. We will of course continue to pursue this information.